Melexis, a global microelectronics engineering company, has added another device to its MLX91208 series of programmable Hall-effect current sensors, with the introduction of an elevated current version. Optimized for the very high fields that characterize hybrid and electric vehicle (HEV) applications, the MLX91208CAV can cope with up to 1000A of primary current. This device complements the existing MLX91208 products which cover low field and high field functions. 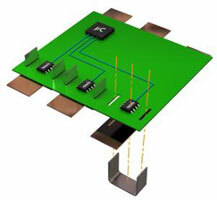 Thanks to the proprietary integrated magnetic concentrator (IMC) technology employed, the sensors in the AEC-Q100-qualified MLX91208 series can accurately measure current without the need for inclusion of the bulky external ferromagnetic cores that are required for conventional Hall-effect current sensors. The innovative IMC structure concentrates the magnetic flux and thereby enhances sensor performance. Melexis’ IMC-Hall® devices thus enable significant savings in board real estate and simplify the assembly process as they are housed in compact surface mount standard SOIC8 packages. These sensors also exhibit a high degree of flexibility, with the ability for current data to be measured through adjacent bus bars, wires, or underlying PCB traces, with industry-leading precision and efficiency. Based on the Hall-effect, the MLX91208CAV provides a fully cost-effective, contactless current sensing mechanism that meets required performance benchmarks. This device intrinsically delivers the galvanic isolation mandated by high voltage applications, while simultaneously eliminating the additional sources of power loss that are found with shunt technology.